Children’s Chapel – Held Sundays at 10:30 a.m., this is an age-appropriate alternative for children four years old through 5th grade. Young energy is welcome! Reading lessons, Bible stories, singing, and sharing a snack make this service special for kids. At the sharing of the Peace, the children enter the nave and join their parents for communion. Children’s worship bags, filled with the weekly Sunday lesson, crayons and paper, are available at each entrance. Vacation Bible School – This week of summer fun and formation is an extremely popular program at Calvary. The volunteers have as much fun as the children. Geared for ages 5 – rising 5th graders and offered during late June, Christian thought and teachings are expressed in a fun and different way. Lots of hands-on experience and great fellowship! 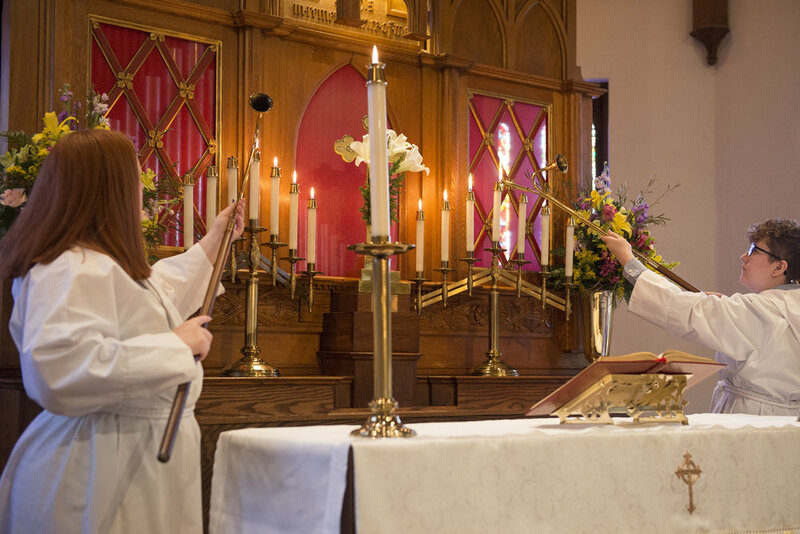 Acolytes – Youth in their middle and high school years are invited to special roles during the 10:30 worship service, including leading processions, carrying the gospel book, and helping set the altar for communion. Teaching and conversation about these roles allows acolytes to engage with worship more deeply while providing a needed service to the congregation.